Watch the skies, always travel with a camera, and never miss a sunset or sunrise! 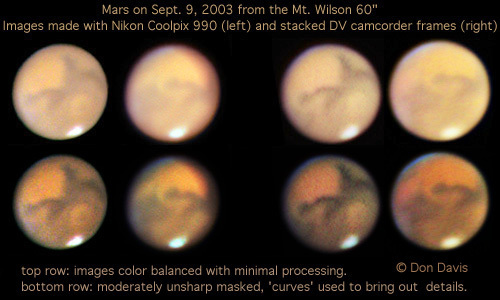 Mars (right) was observed with careful attention to the visual color of different regions of the planet. This drawing incorporated both observing sessions. 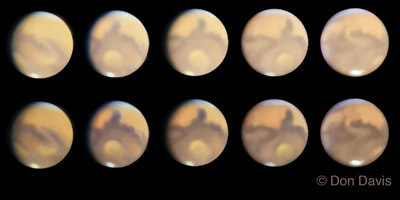 The upper row attempts to convey the visual impression of Mars through the 60 inch telescope, the bottom row shows the colors as seen, in enhanced saturation and contrast using visual observations and photographs made at the eyepiece. The prominent dark blue gray feature 'Syrtis Major' seen in the middle image divides the northern bright lowlands into brighter orange regions to its west,(left) and paler yellower light deserts to its east (right). The circular Hellas basin south of Syrtis Major is a distinct light yellow, surrounded by dark southern hemisphere highlands of a duller less saturated brownish gray. East of Hellas is a distinctly 'rusty' colored region, labeled 'Ausonia' in the maps of the 'classical' markings seen through earthly telescopes. Just before dawn I examined Saturn. The seeing was perhaps 6 out of a best of 10, however in steady moments the outer 'Keeler' or 'Enke' gap on ring A intermittently appeared as a very thin black arc about 20 percent of the way from the outer edge with the ring outside the thin gap noticeably brighter than that within. 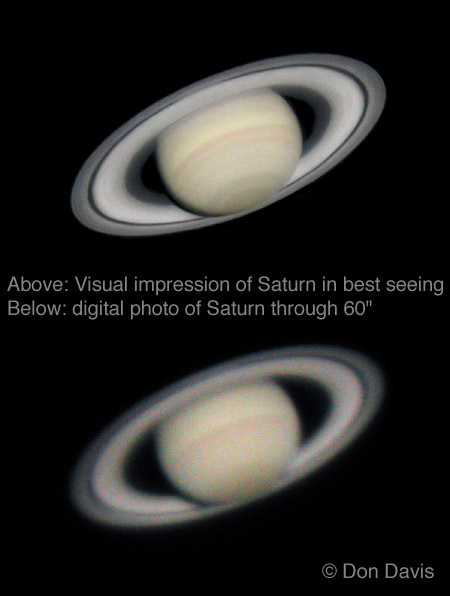 The Saturn images at left are (bottom) a pair of stacked digital camera images made by literally holding the camera up to the huge eyepiece. At top is the same image extensively retouched and reworked in Photoshop to attempt a visual impression under ideal conditions. It should be emphasized that the actual sight through the telescope was characterized by an active unsteadiness, like seeing the planets through more than one layer of rippled glass moving in different directions. This is what was glimpsed on varied parts of the planet in moments when the air along the line of sight was fleetingly less turbulent. 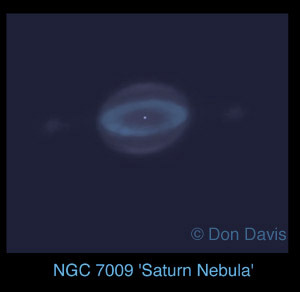 Several of the brighter 'planetary' nebula were examined, the first being the 'Saturn nebula'. These objects are fascinating in their symmetry along more than one axis, and in Hubble images they are second to none as objects of beauty. 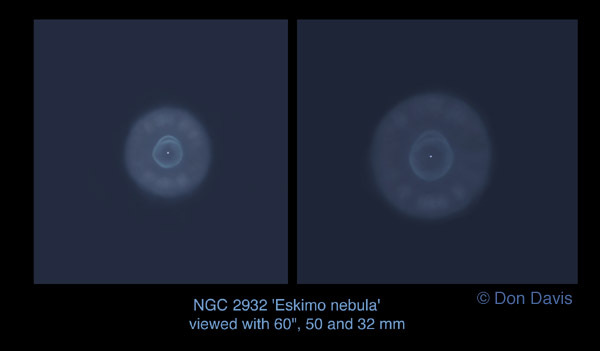 The 'Eskimo' nebula (below) is a rewarding sight in large telescopes, despite the bright skies of Mt. Wilson. The 'Egg Nebula' (below) is an amazing object which Hubble revealed as a 'light at the end of the tunnel' like apparition with hollow cones of light extending from a dense equatorial dusty zone shining on many concentric 'shells' surrounding the young star. 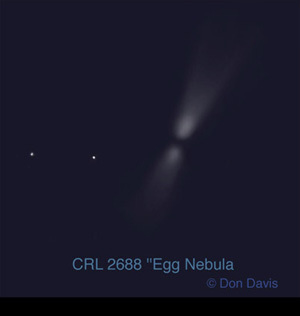 Through the 60 inch the nebula appears as a ghostly foot print with dim conical rays extending from the 'toes' and 'heel'. The former is brighter, and two dim angled searchlight like extensions could be seen spreading from its edges. September 7, 2003: I had a rare opportunity to observe with the Mt. Wilson 60 inch telescope, thanks to the kind invitation of Andy Chaikin. Initially we looked at Mars, and I photographed the planet with a hand held digital camera literally held up to the eyepiece! The northern bright regions are more saturated in color than the southern highlands, and Hellas visually appears distinctly yellowish. 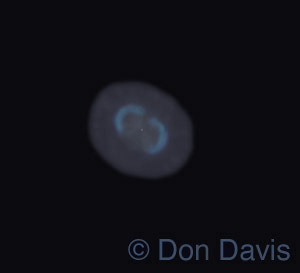 Later we examined some deep sky objects, including the 'Blue Snowball' planetary nebula (above) which revealed a gray fuzzy disk with turquoise gray brighter details. 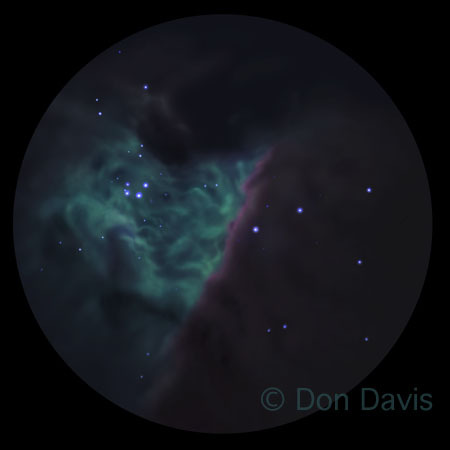 The highlight of the night took place after the Moon set when we looked at the central Orion nebula. (right) The green Trapezium region dominated the field of view, with blue violet stars all over. There was a difference between the visual 'color temperature' of the green and red regions at the dimmer edges of the view. The amazing thing was that the straight edged boundary with part of the 'red' zone visually revealed red-magenta color at the brightest part of the very edge of the 'foreground' component, like a highlight of a back lit cloud. It was unambiguious to me, but only along that bright edge where the threshold of color vision was evidently crossed. This was the greatest sight I have ever seen through a telescope. These drawings were done soon after the session with the 60 inch when the visual impressions were fresh on my mind, referencing photographs but keeping in mind what I could and could not see. 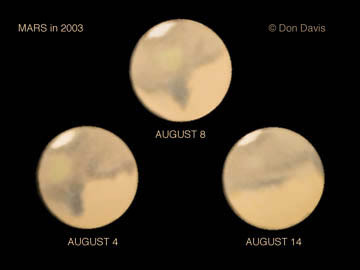 August 4-17 2003: Mars looms bright in the southern skies. I examined the planet in my 6" reflector as it approached Earth. 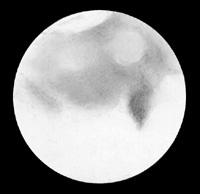 Subtle color saturation and hue differences could be seen across the bright 'apricot' colored disk. 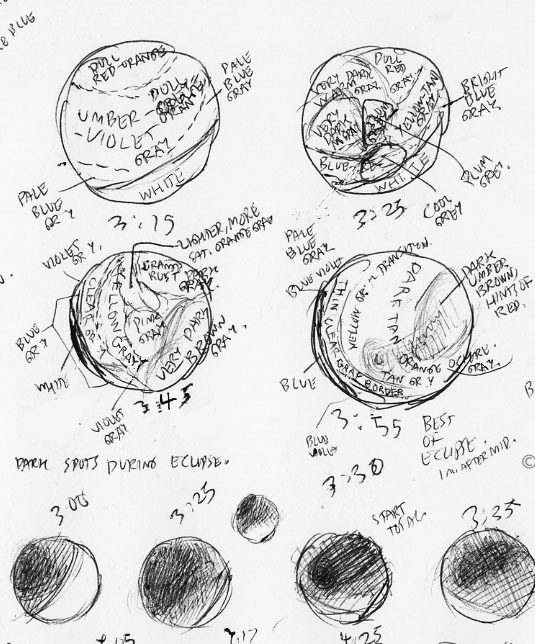 These drawings are based on sketches made at the eyepiece, and closely match my visual impression. The first thing one should examine the skies with are your own eyes, which are an amazingly versatile device superior in overall performance to any camera yet made. It is astonishing how well a dark adapted eye can detect dim and low contrast features, especially by 'scanning' about the sky and allowing the differences between the views to wash across your peripheral vision. While watching Perseid meteors I was amazed at how clearly the Zodiacal light grew in brightness as the sky's apparent rotation carried the Sun ever closer to the horizon. Using a dimmed flashlight I drew in the stars, then the 'brightness contours' or boundaries of zones of approximately the same intensity. The bottom drawing tries to account for the rotation of the Earth changing the horizon line during the drawing. On the last small sideways drawing the first light of dawn is noted, a dramatically compact brighter zone of the sky emerges over the hidden Sun when it comes within about 17 degrees above the horizon. Reddish filtration near the horizon is evident almost at soon as as dawn begins. 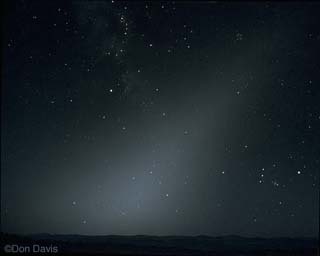 Here is my finished portrayal of the Zodiacal light as it appeared visually. Except for some wide angle images most attempts to photograph this dim vague wedge of light in the sky reveal more of the vignetting of the lens (causing the corners of the frame to darken) than the actual subject. Mars as seen through a large telescope near the time of its close approach to the Earth in 1971. Gerard De Vaucouleurs, one of the great modern astronomers, admonished me that I shouldn't be painting globes of Mars (as I was then doing for the USGS) until I had gotten a good look at the planet through a respectable instrument. The USGS then ran a small observatory with a 16 inch reflector, where I accompanied De Vaucouleurs and Charles Capen, longtime Lowell Observatory astronomer and one of the most experienced Mars observers of all time. We spent a beautiful night observing under the jeweled skies of Northern Arizona. 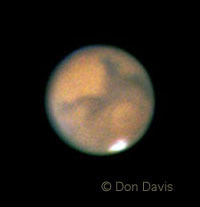 Mars was steady and bright, through the eyepiece comparable to the full Moon in apparent size but a bright apricot orange color, with the South polar cap prominent and the dark wedge of Syrtis Major dominating the right edge of the disk. More details on the disk were visible when using an orange filter. 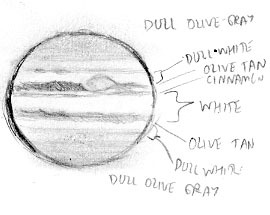 Jupiter as sketched through a 6 inch telescope on a clear still night. Some sense of color can be gathered of the varied cloud bands through the overall dazzle of the planet. 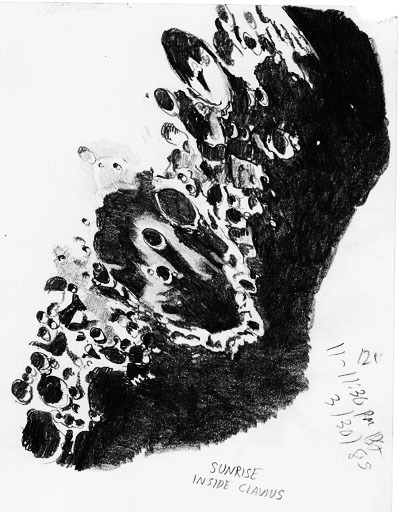 The same telescope was used to sketch the Moon during a time I was interested in trying to 'fill in' some of the Moon's polar regions which at that time were still poorly photographed. The terminator, or boundary between day and night, is filled with deepening shadows emphasizing the considerable relief in the moon's Southern highlands. The view is dominated by Clavius, among the largest of the craters on the Moon's Earth facing side. One slightly foggy evening in Salt Lake City I noticed the Moon and Venus close together in the Western sky. Through binoculars I was surprised to see noticeable color differences in the halations around each, that of Venus appearing white to bluish, and the Moon looking more tan or vaguely golden. 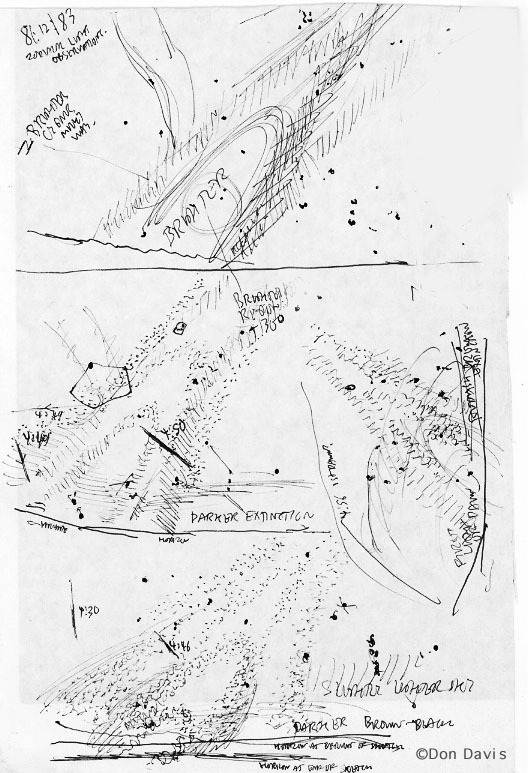 These drawings are part of my 'cleaned up' field sketches, made of the September 6 1979 Lunar Eclipse from dark Grass Valley, California. I found it useful to quickly divide the disk into discreet zones of color and brightness. Later I refined the technique with drawing on pre-printed Lunar maps to save time and provide landmarks upon which to draw shadow and color boundaries. This eclipse was relatively subtle compared with many others, lacking most of the coppery glow characteristic of most such events. The Moon is in effect seeing the light of all the sunrises and sunsets happening at that moment when it is in the Earths shadow. Photographs of this event generally garishly reddened the shadowed Moon, I saw many subtle colors through binoculars and the eye. Later I would sketch such events with the eye aided by a tripod mounted pair of binoculars, a 6 inch or 10 inch telescope, and a small table with a subdued light source and a radio or clock for time reference. As soon as possible after the event I make finished paintings of the event based on my still fresh memory and my field drawings. Sometimes the evening news carries images, useful for brightness and even color 'reality checks' if available. I think the best color photos of these dim eclipses will happen with tricolor photography, either with film or CCD cameras. Here are some of the finished color sketches, done in oil paints. This Lunar eclipse was closer to the 'norm', with the ruddy glow of sunlight passing through the Earths atmosphere spilling into its shadow. There was a bluish border region as noted visually in past eclipses. This Lunar eclipse was far more subdued, perhaps due to large amounts cloud cover and atmospheric dust. Most color films made even this eclipse appear a garish orange red. 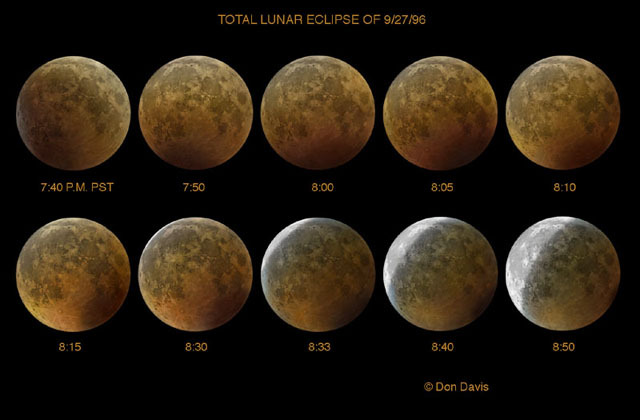 The Lunar eclipse of May 15, 2003 was in progress as the Moon rose, but by the end of totality the Moon had climbed high enough to provide a good look at the shadow colors. This eclipse was of below average overall intensity, with brightness contours sometimes visibly displaced from those of the color zones which generally lay concentric to the curved border of the Earth shadow. The southwest portion of the shadow interior was more saturated in coppery color than the northeast, including a brighter yellow southern region late in the eclipse..